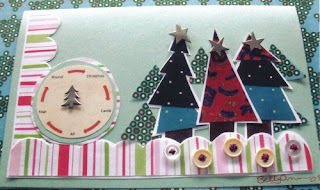 Congratulations, send me an email with your mailing address and I'll pop some Christmas scrapping goodies in the mail. I've known about this Christmas Day but didn't want to believe it was true. But, sadly it is true. One of our CCARY design team members BEVERLEY TODD has passed away. Here's an excerpt from the email I received:"Beverley Todd was certified brain dead earlier today. ...she was taken into hospital yesterday Dec 23rd with a suspected bleed in the brain. Her family have all been able to say their farewells and have given permission for the doctors to take what ever they can for transplant. Something that they are sure she would have wanted." She also went on to say that "I can tell you that Beverley was so very excited at being selected for your next design team and was definitely looking forward to the year ahead." Please keep her family and loved one in your thoughts and prayers. She will surely be missed by a lot of scrappers all over the world.She has touched many lives with her kindness and giving heart. Easy and Quick!! 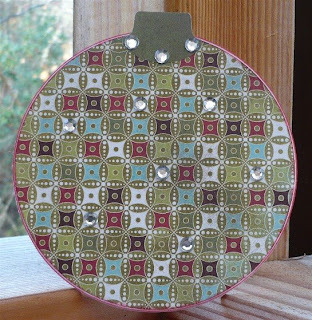 You can use this to put a gift card, money or a small gift such as a pair or earrings in. 1. Seal an envelope. 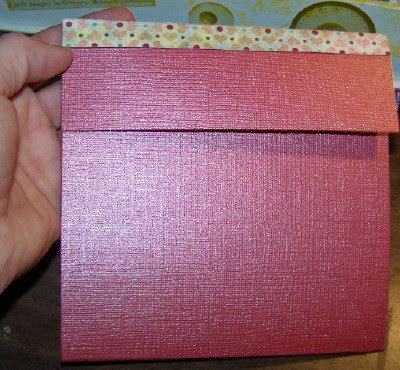 2.Using a tag punch or a tag that you have in your stash, cut out tags on each side of the top of the envelope. 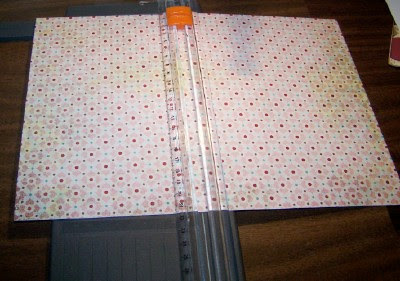 You may have to play with the amount of paper you want to cut away. You want it to look like a little basket or bag. 3.Once you get it looking like you want, then it's time to embellish! 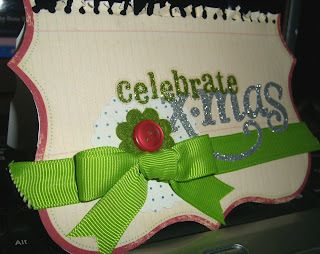 4.Here's my gift bag that I made. 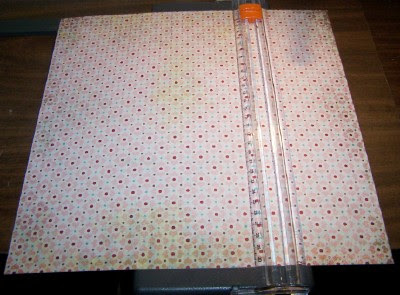 Cute idea!!! For those of you that take on the challenge and post a link to your card, I will draw a name and send the winner aome card making goodies to play with. 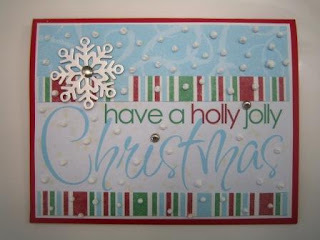 But you only have until Saturday night, December 20th to post your card to be in the draw. 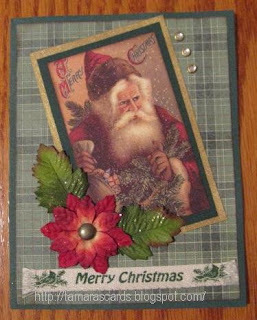 Here is a card I did using an Old Fashion Santa image. 1. 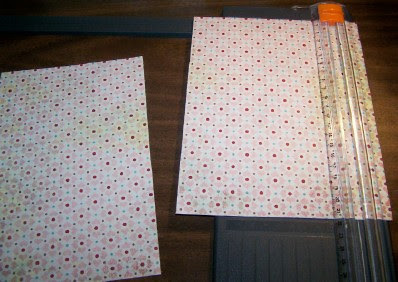 Cut the cardstock down the center so you have -2- 6x12 pieces. 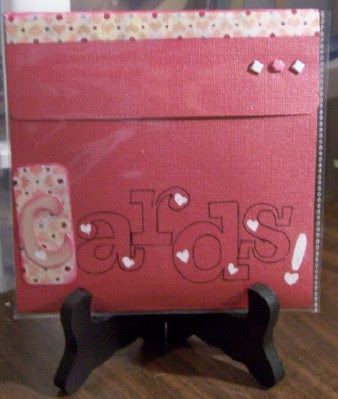 One 6x12 piece will be used to make the card holder. Fold this in half. 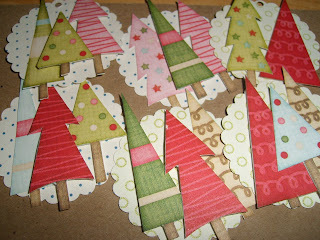 Using the other piece, cut off a piece 2x6. 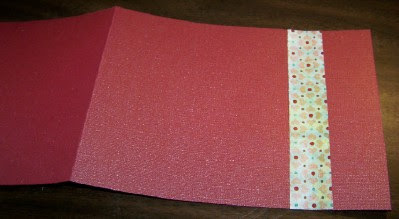 This little piece will be used for the flap of the card holder. 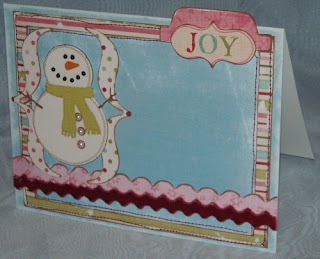 The left-over will be used for a card, so cut it into a 5 1/2X 8 1/2 piece and fold it. Keep all scraps. 2. 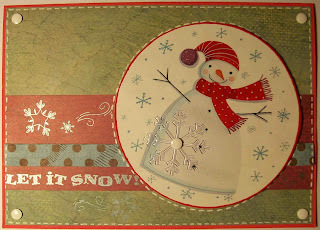 Cut the patterned paper into a 8 1/2X12 piece.Then cut this piece into -2- pieces of 5 1/2X 8 1/2 (for the cards) and fold them.Again, keep the scraps. 3. 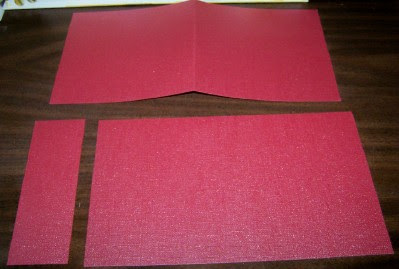 This is what you will have once you have your pieces all cut. 4. 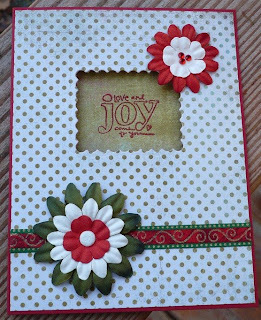 Using the piece that you cut for the card folder (6X12), glue the 2X6 piece onto it for the flap using a piece of scrap, as shown. 5. 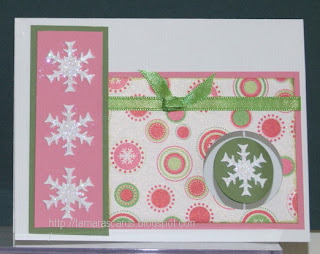 Using the card pieces and scraps create any occasion cards and tags. I've made a few of these and given them as gifts. Great idea. You've been a great inspiration to everyone and it was greatly appreciated! Be watching for a new challenge coming up on New Year's Day!!! 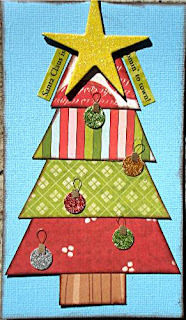 Can you imagine that at the end of next year, if you do ALL the challenges and make at least 5 cards a month, you'll have 60+ Christmas cards!!! Wow! 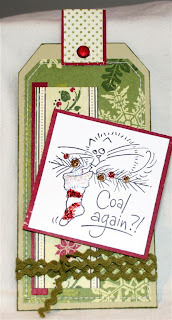 I did this, starting in January and I had plenty of cards when I got them ready to mail this weekend. 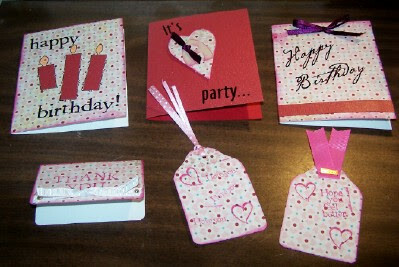 And every family is getting a handmade card, and everyone's card was different! My sister has a cooking blog and she posts delicious, tried and trusted recipes for cookies, cakes, and lots more!!! Check it out! It's called COOKING WITH CARLA. 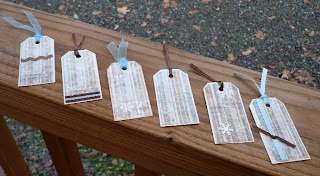 Today is the day to use up those scraps you have laying around and make some Christmas Tags. 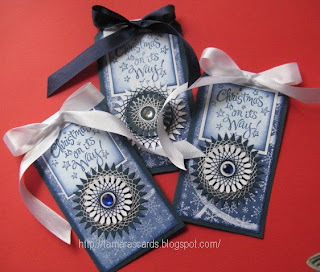 So we challenge you to make tags for all those gifts you'll be giving this year. Any shape or size will do. 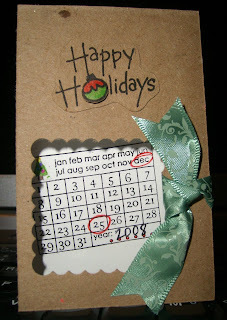 Here are a set of tags I've done for a tag exchange. Have fun and don't forget to post. 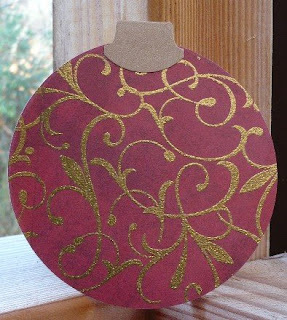 Today we challenge you to make a SHAPED card for Christmas! 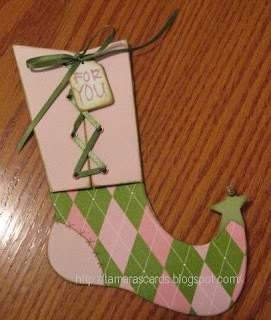 This Stocking card is one of my favourite shape cards to make. So come one ladies and show us what shapes you come up with. Yay! Beverley, congrats to you!!!!!!!!!!!!!!!!!!!!! I'll be getting something to you in the mail in the next few days!!! Now, on to December's challenges. 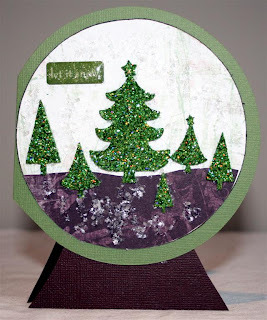 Tamara has 1 posted (WINDOW CARD CHALLENGE) so far and I think she has a couple more planned! Watch for them!!! Remember to let us know in one of the challenge posts if you have completed your 5 cards in order to be eligible for the month-end prize!!! 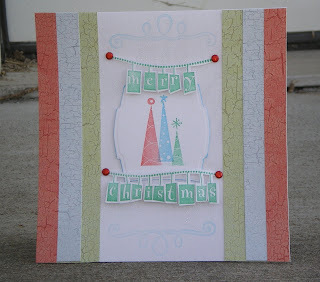 Today we challenge you to make a window in your Christmas card. Windows can be hand cut, punched or dig out those die and cut away! 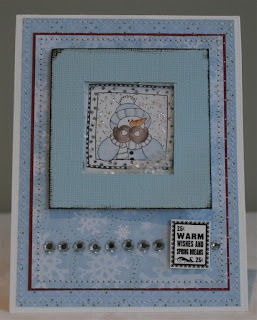 Here is a card I did, I punched a circle in the corner and then dangled a snowflake in the middle so it turns when you open the card. Can't wait to 'see' all the windows.